Sox Vs. Cards: 5 Things To Know About The World Series : The Two-Way It's a matchup full of baseball lore: The two teams have met on three previous occasions dating back to 1946. The Series begins Wednesday in Boston. 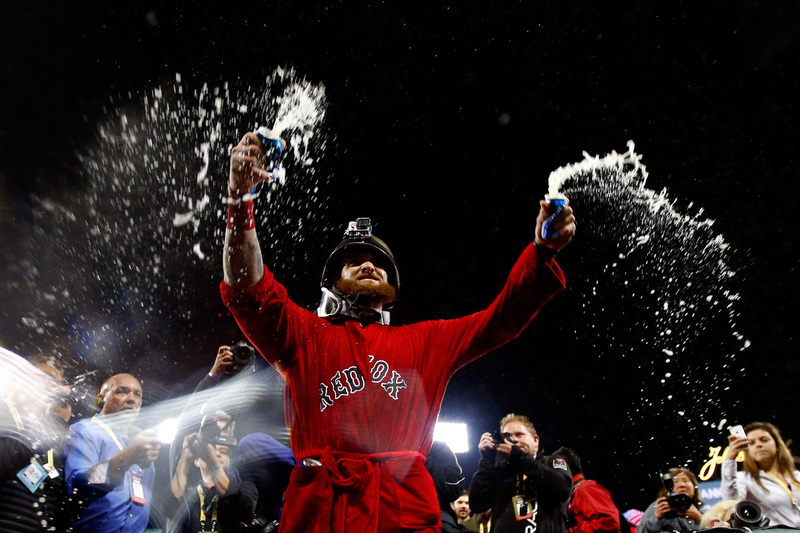 Jonny Gomes of the Boston Red Sox celebrates after defeating the Detroit Tigers in Game Six of the American League Championship Series at Fenway Park on Sunday. The Boston Red Sox clinched the American League pennant last night during a 5-2 win over the Detroit Tigers in Game 6 of the American League Championship Series. That means the World Series matchup is set: It'll be the Red Sox vs. the St. Louis Cardinals beginning Wednesday in Boston. -- The Sox have redeemed themselves this year. Last season, they ended in last place with only 69 wins; this season, they clinched the American League East with 97 wins, tying with the Cards for the best season in baseball. -- This will be the first time since the Braves and Yankees played in 1999 that league win leaders will face off in the World Series. -- MLB.com reports that the Cards and Sox have met in the World Series on three previous occasions — in 1946, 1967 and 2004. The first two meetings went to game seven and ended with a Cardinals win. -- As the AP reports, the 2004 series marked the third Series visit for the Sox during the past decade. They steamrolled St. Louis in a four-game sweep and won their first championship since 1918. That said, the two teams have not played each other since 2008. -- The Cardinals are a formidable — and surprising — organization. They have captured four pennants in 10 years and won the World Series in 2006 and 2011, as well as 9 other times in their history. The New York Times reports that it would be easy to say the Cards are the Yankees of the National League. But, they managed their wins without the kind of stars the Yankees have. In fact, the Cardinals "develop names that most have never heard of." So keep an eye out for Carlos Martinez, the 22-year-old reliever who throws 99 mph fastballs and had never played anything above Double-A baseball before this season. An earlier version of this post said the Cardinals and Red Sox had met four times in past World Series. They have, in fact, met three times — in 1946, 1967 and 2004. Also, the Cardinals have won the World Series a total of 11 times, not 12, as originally implied in the math.